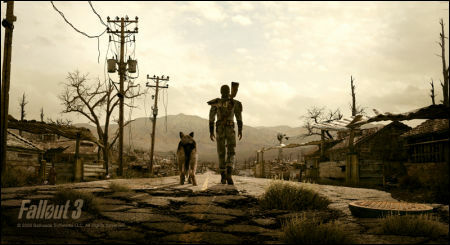 Nearly every free hour I’ve had since the the release of Fallout 3 has been spent wandering the post-apocalyptic wastelands portrayed in the action-RPG game world created by Bathesda. I absolutely did not expect to be as swept up by the amazing atmosphere and story created by the developers, yet I would often find myself staring at my computer screen late into the night, wishing for just a little more time to explore one more undiscovered area in the game’s barren and war-torn landscape. In many ways, the highest compliment I can give to the game is that it makes me look forward to re-entering it’s bleak world as soon as I get home from work. 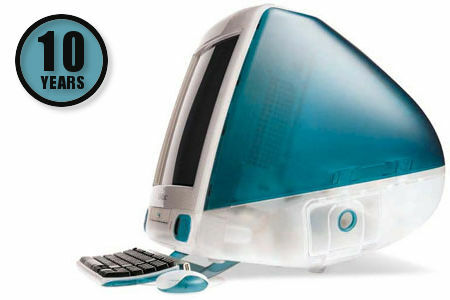 August marks a very special anniversary for Apple in that ten years ago it introduced the first iMac to the PC market. Walking through the PC aisle today with all the different and colorful design choices available might make it easy to underestimate the impact the “Bondi Blue” iMac made. However, 1998 was time where most computers were designed as boring beige boxes more at home under a company desk than in your home. The idea of a simple to setup all-in-one home PC had been attempted before, but the iMac really cemented the idea that a personal computer could be an experience versus a simple device. Beyond the outward design, the iMac turned heads with a number of technology decisions that were controversial at the time, but are now standards. Some, for example, balked at the lack of floppy drive, but now many see the iMac as one of the death knells of those drives. The iMac also dropped several common Macintosh ports in lieu of utilizing USB connections, which at the time were very uncommon. The release of the iMac also signaled a revitalized Apple. Steve Jobs had just returned to the company, which had been dealing with years of poor sales and struggling stock prices. However, the release of the iMac, designed by a team led by Johnathan Ive, sold nearly 800,000 units in the last half of 1998 and brought Apple back to profitability. In the decade that followed, Johnathan Ive and his team continued to innovate with the Apple line, including iPods and iPhones, but the iMac in particular went through some of the most striking changes. Those changes also swept through the rest of the PC industry and consumers responded positively by basing buying decisions on design as much as performance and functionality. It’s precisely because of those striking designs that consumers can walk through the PC aisle and find a computer that not only fits their lifestyle needs, but their fashion tastes as well. April and August are both “Recycle Your Computer Month” in Cuyahoga County, so residents with unwanted computers, monitors or printers may want to visit the Cuyahoga County Solid Waste District website in order to find out where to bring their equipment for safe handling and disposal. The website answers many frequently asked questions about the program, including what happens to any private data on the hard drive with any computer you bring in.